Single pressing can be also be called full pressing and usually be applied for smaller capacity oil milling plant, single pressing machine will be used in this process. This type of pressing machine work on the principle of mechanical extraction and it extracts oil from the seeds. If the seeds have high oil content, double pressing should incorporated for maximum yield. The oil could be extracted as much as possible, the oil residual in cake is around 5-7%. 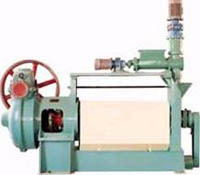 The use of single pressing machine doesnt need the extraction of oil through chemical treatment.